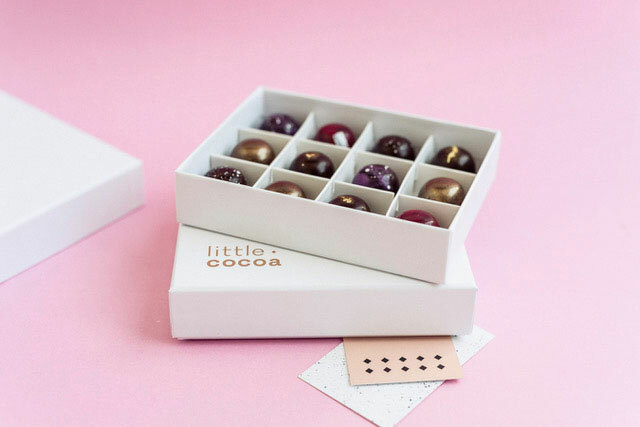 Little Cocoa is a new Gold Coast business that offers hand crafted chocolate pralines as bomboniere/wedding favours for couples on their big day. We provide two exquisite chocolates inside a white gloss box which can be embossed with a special message or the bride and groom's names and wedding date on top. We love taking on flavour requests and also colour requests to match the wedding theme. What is the most memorable wedding you have been involved with? I was lucky enough to be a part of my Uncle's wedding, held at Tiffany's in Maleny, in the Sunshine Coast hinterland. It's just the most stunning location, held on the side of the mountain with fabulous views of the Glass House Mountains and across to the ocean. It was a beautiful ceremony and reception that flowed effortlessly without any hiccups. I realised that to pull off a flawless event like that, you had to have a solid team behind you bringing together all the fine details to make it spectacular. I am really looking forward to helping more brides and grooms make their wedding memorable. Any tips for our brides & grooms? Amidst the big ticket decisions such as venue, wedding dress and photographers, I'd also encourage couples not to forget other details such as the styling, flowers and bomboniere or wedding favours. Planning these ahead provides opportunities to coordinate across colours and themes so everything ties together beautifully on the day. Why should our couples choose your business for their wedding? I think couples really want to have an authentic, unique experience when it comes to their wedding. Many couples are opting for a smaller, more intimate event and using the best local vendors they can find. This is what I pride myself on with Little Cocoa - offering a bespoke, hand-crafted product that is made fresh to order and enjoyed by everyone. What extra services do you offer to ensure it truly is a special day? Dessert tables are a hit with modern weddings as people veer away from the traditional offerings. We want to offer chocolate pralines as an inclusion on a lavash dessert display amongst other delicious sweets. They're different, beautiful to look at and delicious. Little Cocoa are open to orders from all over Australia, within the Australia Express Post network. With South East Queensland orders, Little Cocoa will deliver personally or they can be picked up from their commercial kitchen in Southport on the Gold Coast.